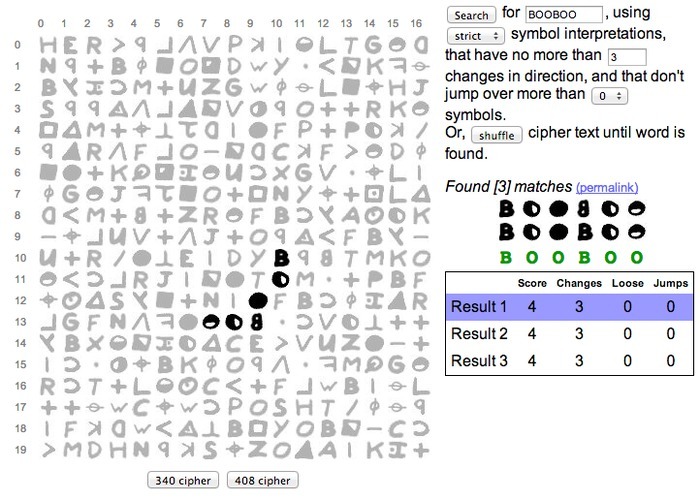 You enter a word, click the search button, then the gadget hunts through the cipher text for the word. Symbols are interpreted directly as normal letters, and the letters have to be next to each other in the cipher text. Sometimes you can find words that appear in straight lines (HER, BOO, GOD, ZODAIK, etc.) Other times the words are folded up in different directions (BOMB, DOOR, PENTOBARBITONE). Enter your search here. Then fiddle with the other settings, or just click on the Search button to accept the defaults. Selecting “loose” will usually find more matches, since the search will force many symbols to look like other letters. The search will match words that wander in different directions. You can limit the number of changes in direction by entering a new number here. For example, if you only want to match words that appear in perfectly straight lines, then enter “0” here. Be careful with this setting, because sometimes it makes the search take too long, which may make your browser unresponsive for a little while. Shuffling the cipher text is a way to test how easily words can appear by pure chance alone. When you click the “Shuffle” button, the cipher text is shuffled like a deck of cards until your word is found. It will stop after 1,000 shuffles if your word isn’t found. After clicking the “Search” button, any results are displayed here. The “permalink” link gives you a way to bookmark the current search. Here are some sample permalinks: POINTYBEARD, DECIPHER, PARADICE, MALEIDENTIFIED, WELLROTTED, and MARTYR. This part of the results shows you how the symbols are interpreted. Any strongly ambiguous symbols are manipulated to clarify how they are interpreted. In this list of results, the highlighted result is shown in the cipher text grid to the left. You can see different results by moving your mouse cursor over different rows of the table. Each result is shown with a score and some other values. “Changes” shows how many direction changes were required to find the word. “Loose” is a count of how many loose interpretations were needed to find the word. “Jumps” indicates how many times a symbol had to be skipped to complete the word. These are combined into the “Score” which is a way to estimate the quality of the result. Lower scores are better, and they are shown at the top of the list. At the bottom of the cipher grid, you can click these buttons to switch between the 340 and 408 ciphers. What words can you find? Leave them in the comments!